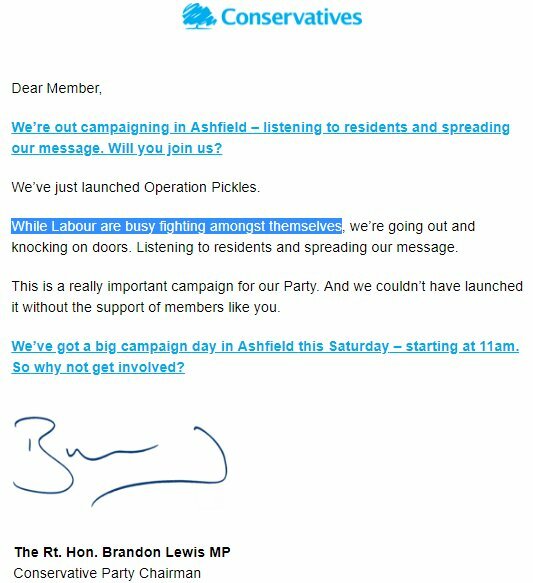 Brandon Lewis (Conservative Party Chairman) has just emailed Tory party members telling them “Labour are busy fighting amongst themselves”. The internecine war must end. The leadership has become reactionary and is playing into the government’s hands; not to mention billionaire media owners and zionist ideologues. Social media must now play a strong role too. Reacting against artificial agendas created cynically elsewhere has to end. Definitive rebuttals and in house justice. Yes. Fighting austerity and inequality. Yes. Championing the oppressed. Yes. Being stitched up by sneering and divisive forces. No. This brief by Lewis to constituencies is about ensuring that the Tories pick up votes whilst slighting Labour for the carnage occurring in some of the public perception. NO MORE – good folk or we will fail and they will win. WE must now be assertive, strong and active. We must go laden with facts out in to the communities. Social media is all well and good but it is not enough. Present people with reality. Some will reject others will embrace a new hope. Or carry on as we are and potentially self destruct and back to square one. It really is now down to us. Collaborate, cooperate and succeed.